An Indian army soldier walks during a gunbattle between Indian troops and militants in Sopore on Tuesday. Srinagar, Indian Administered Kashmir (CNN) -- The death toll among Indian security forces rose to four Wednesday in the second day of a firefight with militants in northern Kashmir, Indian authorities said. A trooper was killed Wednesday by a sniper shooting from beneath the debris of a razed house, Indian authorities said. The militant gunman was killed by Indian troops, bringing the confirmed death toll for militants to two in the continuing operation in Sopore, which is about 34 miles (54 km) from Srinagar, the capital of Indian-administered Kashmir. 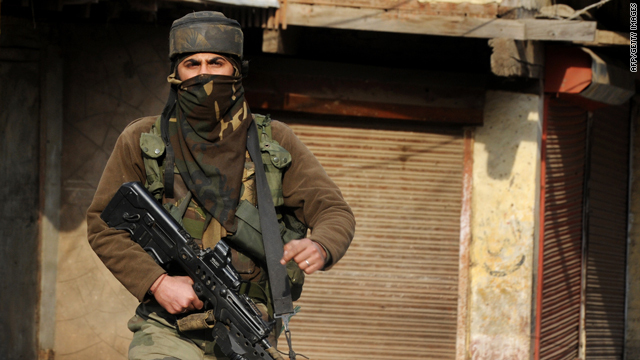 The firefight began Tuesday when Indian forces cornered militants in two houses. An Indian army officer and two troopers were killed along with one militant in the exchanges of gunfire. Indian troops blasted the two houses and moved in to clear debris. "The debris clearance operation will continue and it will take some more time. We will come to know about exact militant casualties once it is completed," said Farooq Ahmad, the Kashmir zone inspector general of police. Kashmir is a mountainous area divided into regions administered by Pakistan and India. Indian forces are in constant fights with militants seeking independence for the area.